A Journey of Hope and Peace: A Party, New Hair, and the Beach! It is getting closer to May 28th. I will freely admit that I am getting anxious, and I just don't want to go through the surgery. I wish this had not happened. I have so many people praying for me right now that I know I can do this, and I know God has something in store for me. On Monday night, my friends from the Maple Hill Church of Christ had a "farewell" party. We said bye-bye to the cancer and welcome to my new body that I will be getting. Tammy Robertson and Heather Wamble organized the party. Tammy grilled hamburgers and chicken and Heather made a lovely cake. Everyone else brought all the extras and we had a great time. I want to thank all my friends who showed up and those who were not able to make it because of babysitter issues. Thank you to Rachel Gray, Danielle Gray, Amanda McNabb, Amanda Denning, Melissa Simpson, Kolleen Mangrum, Sarah Scoles, Anita Keith, Autumn Roeder, Danielle Pruitt, and Nicole Brashear for coming and having a good laugh. Forgive me if I left out a name. I also decided to go ahead and get my hair cut before surgery. I decided that I wanted something that didn't take a lot of effort and would look good if I just washed it and went on my way. Since I will be having chemo and had a good chance of losing my hair, I thought it would make it easier on me and my family if I didn't have big long hunks of hair falling out. In planning my haircut, my friends talked me into coloring my hair. So I had it dyed back to blonde and added pink. 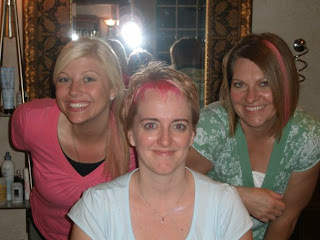 Tammy Robertson and Danielle Gray came with me and they also dyed their hair pink. Tammy did a strip on the side and Danielle had the whole underside of her hair dyed pink and my hair was CHOPPED off and I had the pink added to the front. Several others wanted to dye their hair pink but in order to have pink in your hair, you have to BLEACH a spot first so the pink will show up. The pink will wash out but the bleached spot is there until it grows out or you color it. So for those not brave enough to bleach their hair, they got pink hair extensions. I got one for Faith to wear also. 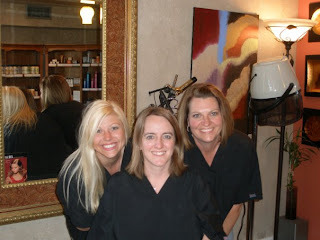 A big THANK YOU To Stephanie at Identity Hair Salon in Hermitage for doing our hair. She was awesome and a lot of fun. She did not charge us for all the work that she did. She said it was her donation to Breast Cancer Awareness. She will have a new client once my hair comes back in. Please keep praying for me. Like I said, I am starting to get anxious and worried. I am ready for this to be over with so I can keep living my life and watch my children grow. Mary Ann, I got tears in my eyes reading your post today. What a blessing to have such dear friends and family. I absolutely LOVE the PINK!!! And your haircut is darling. What a great idea! May God continue to bless you, your family and your friends and give you peace. LOVE the sassy hair cut and pink! That is so sweet of your friends to go with you, too! Have fun in Florida and try to relax and enjoy time with the family. We're still praying for you! Never in my life have I been more proud of the Lord's church. Your friends have been such a blessing to you, and I'm so grateful you moved to Lebanon, to Maple Hill, and were put with some wonderful people. I wish I could be there with you through all of this, but we'll be there for the surgery. God has always taken care of our family, and I know He will take care of us now as well.